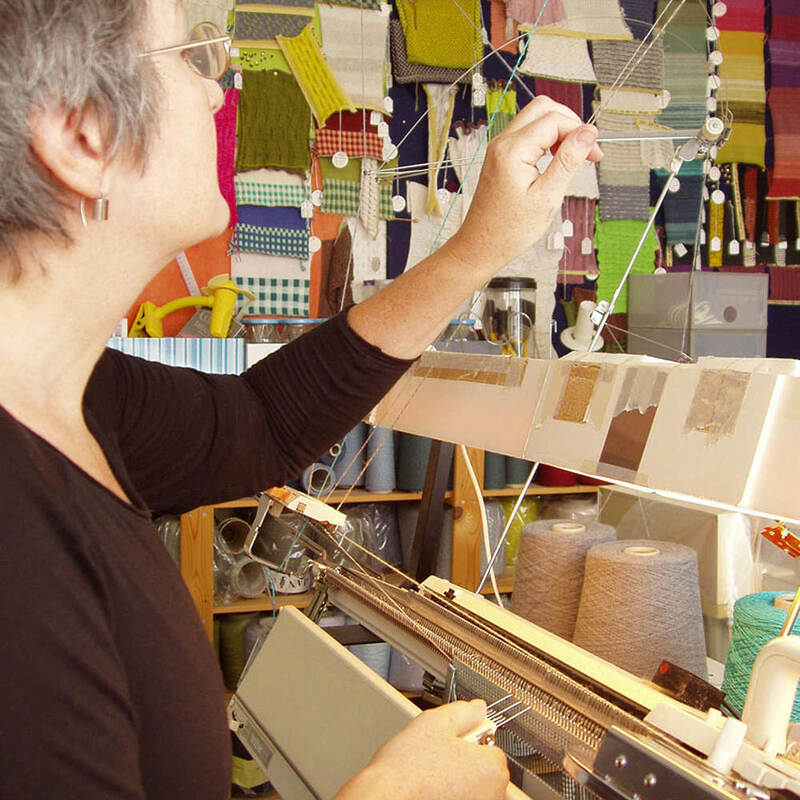 Susan Holton is a designer/knitter who creates original contemporary knitwear and accessories. She creates her knitwear on a domestic knitting machine (comparable to a weaver’s loom) and uses top quality yarns in combinations of silks, linens, cottons and viscose. She explores stitch, yarn, fibre and colour in experimental knitted and dyed samples, to achieve the colour, texture and drape she’s looking for. Many pieces are hand dyed or hand painted and/or exploit the random nature of Sue’s techniques so they are unique - no two are ever quite alike. Everything is finely crafted with meticulous attention to design detail and quality of finish, so garments fit and fabrics drape beautifully. Her knitwear is lovely to wear as well as beautiful to look at. Sue’s knitwear is available in a range of sizes and to commission. She encourages visits to her home/studio (by appointment). In June 2018 she opened her studio as part of Surrey Artists Open Studios - visitors were able to see her at work and browse, try on and buy items from her current collections and sale rail. She was joined in demonstrating by three fellow Surrey Guild of Craftsmen members. The group (known as ‘Kent Road Studio’ after the road where Sue lives) will be taking part again in 2019. You can find more details here. New on Sue’s blog - a gift guide for Spring… so if you need ideas for gifts for Spring birthdays and Mother’s Day, you can find some lovely handmade gift ideas in my guide: 12 favourite Spring gifts. Also new on Sue’s blog is a pictorial review of Christian Dior : Designer of Dreams, the fabulous exhibition currently on at the V&A. Because of the popularity of the exhibition the V&A has now extended the run to early September 2019. More information on the blog here. Please don’t hesitate to get in touch if you’d like to know more. You can also find Sue’s knitwear on her web site and at shows and events. If you would like some pointers to help you choose and buy the right size when you buy knitwear and other clothes online, Sue has written a blog post (here) which you might find helpful.